DiTullio, Ada M. (March 28, 2019). Age 98. Beloved wife of the late Emil P. DiTullio. Loving mother of Emil F. (Jane) DiTullio. She will also be missed by her three grandchildren, Michelle, Robert, and Jason; and three great grandchildren, Lea, Grayson, and Isaac. 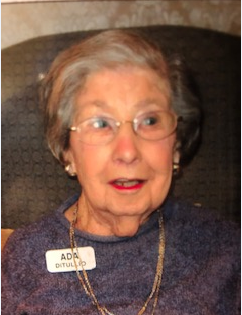 Relatives and friends are invited to Ada’s Memorial Service, Wednesday 4/17, 2:00PM at Spring House Estates Auditorium, 728 Norristown Rd., Ambler, PA 19002. Interment Private. Flowers may be sent or contributions in Ada’s name may be made to the Spring House Samaritan Fund; send to ACTS Legacy Foundation, P.O. Box 90, 375 Morris Rd., West Point, PA 19468-0090. Please write SHE Community 23 on the check memo.